The study uses data from the German Socio-Economic Panel (GSOEP) provided by the German Institute for Economic Research (DIW). Data access will be granted after signing a contract on data distribution with the DIW. Detailed information can be found on the website: http://www.diw.de/en/soep Detailed description of the data can be found online and in a general survey by: Wagner, G. G., Frick, J. R., and Schupp, J. (2007). 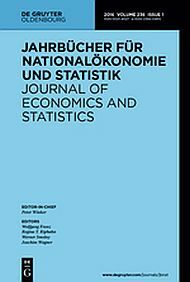 The German Socio-Economic Panel study (soep) - Evolution, Scope and Enhancements. SOEPpaper No. 1, DIW Berlin, The German Socio-Economic Panel (SOEP). The study uses SOEP v.29 with all available waves (1984-2012).